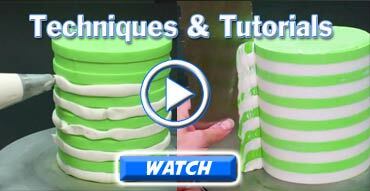 Make Multi Colored Stripes on Buttercream, Ganache, and Royal Icing frosted cakes in no time! Simply frost the cake, smooth the frosting with the straight side of the comb, then flip the comb over to the toothy stripe side and comb out perfectly spaced stripes. Refrigerate the cake until solid, fill in with whatever color stripes you'd like, and flip back to the straight edge of the comb to gradually scrape away the excess icing until perfect two (or more) toned stripes emerge! Stainless Steel Comb holds heat to smooth better than plastic combs, this is the real deal!